Today Jared Loughner pled not guilty in a Tucson federal court to 49 counts related to the January 8 shooting in Arizona. 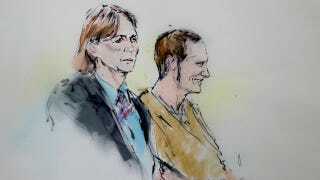 Loughner was not photographed today, but as you can see in this disturbing courtroom sketch, he smiled throughout the proceeding. Some who were wounded in the attack saw Loughner for the first time today, The New York Times reports. The hearing took place just one floor up from the former chambers of Judge John M. Roll, one of the six who were killed. Last week, Loughner was charged with 49 federal counts of murder and attempted murder in an unusual, and possibly risky, move. He had already been arraigned for the attempted murder of Rep. Gabrielle Giffords and her two aides, but according to The Washington Post, prosectors had 46 new charges added on the theory that the Tucson Safeway counted as protected federal ground while Giffords was holding an event. Though Loughner could be prosecuted in state court for the murder and attempted murder of those who weren't federal employees, prosecutors say they want to treat all the victims equally. "These victims were exercising one of the most precious and fundamental rights of American citizens: the right to meet freely, openly and peaceably with their member of Congress ... It is a civil right. And their safety in participating in this federal activity is protected by federal law." However, there are concerns that the strategy would make it easier for Loughner to appeal a conviction — if the case even gets that far. The defense opposes the prosecution's request for for psychological tests, but Judge Larry A. Burns said today that evidence, including Loughner's rambling posts and videos on the internet, raises concerns about his mental state. One prosecutor said Loughner has "severe mental issues" and has been hearing voices. He added, "Certainly every murder is irrational, but this one is more irrational than others."